Mary’s Song. A Christmas Journey..
Mary gets pregnant and she sings. When my wife got pregnant, she quit smoking. Maybe all women do something significant when they find out that their body has begun to replicate and much of the time, according to brief survey done today among five women around me who had, like Mary, been pregnant (though not immaculately), that thing is usually to get quickly into some form of community with other women. This is, after all, one of those things in a woman’s life that a man, no matter how empathetic, metrosexual, or even gay he may be, cannot- try as he might- understand in the way another woman, with a womb, can. Mary went to be with her cousin Elizabeth who was also pregnant under very very odd circumstances. Elizabeth’s husband, the priest Zechariah, was her baby’s father, but she was a senior citizen- beyond menopause, beyond all hope for having a child in a culture where having a child or, even better, childREN, was a religious necessity for being cool in the eyes of YHWH. So, that Elizabeth was pregnant after also having her pregnancy announced ahead of time by Gabriel, was a pretty big deal. About as big a deal as anyone except Mary could even begin to imagine. It is helpful to me when reading songs in the Bible- be it Hannah’s song, any of David’s songs, or, in this same chapter 1 of Luke, Zechariah’s song, to put some tune behind the words. Yes, it sounds odd and it doesn’t work out rhythmically at all, but for the sake of history, go back and add a song. “The Hallelujah Chorus”, or “Happy Birthday”.. it doesn’t matter but it will be historically helpful. It will give you a feeling for history. It will. The song places Jesus very much in the Jewish tradition. As YHWH was faithful and merciful to Israel beginning with Abraham, God is now continuing to be faithful and merciful with Israel through Mary and her child. Mary is grateful to God because she is Jewish and because this is something vital and important to the people Israel. 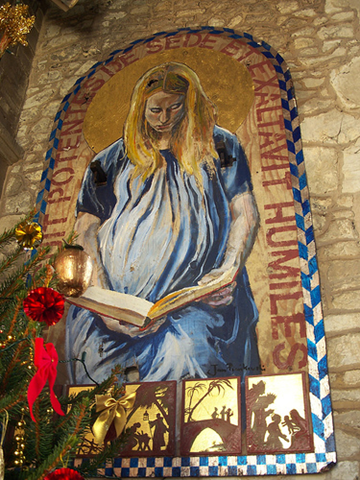 An unusual interpretation of the Virgin Mary by the Polish-born children’s book illustrator Jan Pienkowski in All Saints Chapel, Marsworth, Buckinghamshire, England. Mary sings the song in response to Elizabeth’s admiration of Mary’s faith. Mary consistently deflects attention off herself onto Jesus, even here, in the beginning. It is reminiscent of John the Baptist’s declaration made after he baptizes Jesus: “He must increase; I must decrease.” According to Luke this is a Christian ideal- diminishing to self and exalting Christ- that began with Mary. It is a tradition which sometimes, in some circles, among some believers, continues today.